OK, I'll admit it. 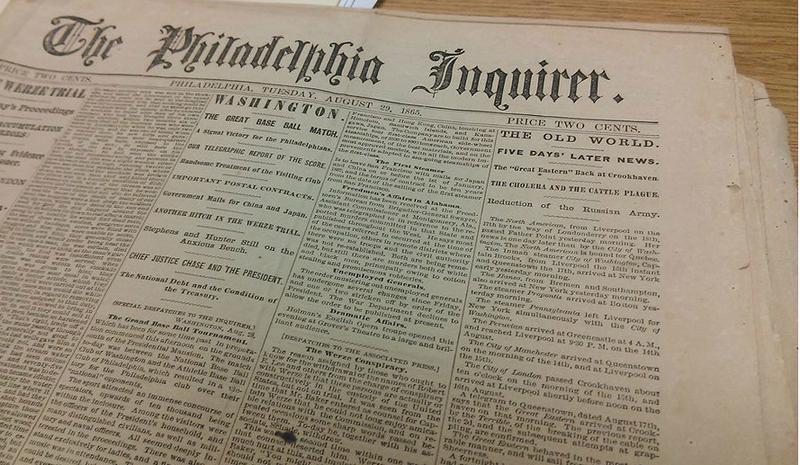 I'm obsessed by all the historic coolness to be found within the pages of this August 29, 1865, issue of The Philadelphia Inquirer. I've already written about the baseball game and the "Werze" trial. 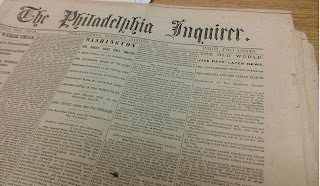 So I'm just going to call this Part 1 and start sharing a bunch of interesting excerpts and snippets from this 148-year-old newspaper in the coming weeks. Maybe you find this stuff as fascinating as I do. A Dead General. The body of General Crocker, of Iowa, was taken to the depot this afternoon, escorted by a regiment of cavalry, a regiment of infantry, and numerous military officers and civilians. It will be taken to Desmoines [sic], Iowa, under a guard of eight men. The Cattle Plague. The "cattle plague" continues a prominent topic in English journals. The disease continues its ravages, and was spreading in various parts of the kingdom. It was disputed that the disease had been introduced by foreign cattle, and evidence was adduced to show that it was generated in England. FAIRMOUNT FEMALE COLLEGE, GREEN ST., west of Twenty-second street, Philadelphia. This superior Boarding and Day School for Young Ladies will begin its next term Sept. 13th. A Preparatory Department for young pupils. For circulars, apply to or address Rev. J.W. BARNHART, A.M., President. YOUNG MEN AND BOYS' SCHOOL.—REV. JAS. G. SHINN, A.M., will open an English, Classical, Mathematical and Scientific School for Young Men and Boys, No. 1906 MOUNT VERNON Street, on the first Monday in September. The instruction will be particular and thorough, such as will prepare young men for business or college. For terms, &c., apply as above. WEST BRANCH BOARDING SCHOOL, MALE AND FEMALE, JERSEY SHORE, LYCOMING COUNTY, PA., TERMS, $150 PER ANNUM. A Christian home with thorough instruction. Catalogues with full particulars, of Philip Wilson, Esq., No. 409 Chestnut street, or address as above. F. DONLEAVY LONG, A.M., Principal.